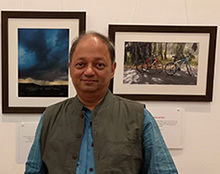 Milind Vishwas Sathe, who is an art promoter, is the founder of Indiaart Gallery and the art portal www.indiaart.com. Indiaart showcases Indian Art and reaches out to art collectors and aficionados worldwide. He is actively engaged in several art projects by way of conceptualising innovative art practices and partnering with several organisations and institutions to implement these. He set up Art India Foundation, a trust which undertakes activities and projects to promote art and spread art awareness especially among children including underprivileged and challenged children. The flagship projects are "Khula Aasmaan" - a platform for creative expression by children and young adults and "Armaan", which tells the stories of people with special needs who are fighting despite the heavy odds that they face. Another project created by Milind is CSRworld, which is a fourm for corporate social responsibility. CSRworld.net will showcase case studies of CSR initiatives by corporates as well as highlight NGOs and trusts looking for support and funding. Milind is an entrepreneur with more than 25 years of experience in I. T. sector which includes software products and services marketing, product development and ERP implementation. In the last 15 years, he has focussed on work in the area of making internet work for a large number of organisations. He has worked with more than 500 clients in India and abroad in the areas of Internet strategy and consulting, web content creation, web applications, e business and social media. He continues to engage with several clients through his firms - Link Software & Systems Pvt. Ltd. and New Media Ventures. Milind did his graduation in Electrical Engineering from Delhi College of Engineering, Delhi (University of Delhi) and Post Graduation in Business Management from Symbiosis Institute of Business Management, Pune (University of Pune). Prior to graduation, Milind completed his junior college at Fergusson College, Pune and schooling at Jnana Prabodhini Prashala, Pune. His active interests include travel, photography, cycling, history and media.